Our deli offers the best meats, cheeses & other goodies to satisfy your needs. 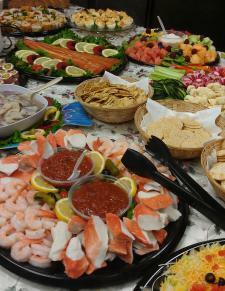 Looking for a salad or a meat, cheese or produce tray for your next event? Ask one of our experts today - they can help you decide what to get and how much you will need. Our deli has daily lunch specials every Monday through Friday! You can view the monthly menu HERE, click on the LINKS link at the top of the page, or call to have our monthly menu faxed to you. We also have assorted sandwiches, desserts, fresh coffee, Gold'n Plump whole rotisserie chickens, and baked or fried chicken. Our salad bar is available Monday - Friday. Catering is available, call the deli for details.